Last week I spoke of my desire to find a gluten-free all-purpose “cup-for-cup” flour blend that I can use to bake a tried and true wheat recipe — without having to make it several times in order to get it to look, taste and feel like it should. As a cookbook writer and a celiac, I’d like someone to make a “cup for cup” blend, or almost “cup for cup” blend, that works, so I can buy it and use it for the recipes I develop in my cookbooks (and in my own life when I want to bake something without the blend I use now). In reality, I doubt there can ever be a perfect “cup for cup” blend. But at the very least, I’d like it to be close enough so that I can tweak the recipes in my books and get as great product as I’m often able to do with my Brown Rice Flour Mix (using the Authentic Foods extra finely ground brown rice flour). I tested Thomas Keller’s Cup-4-Cup a couple of years ago and Nameste Perfect Flour Blend earlier this year. My search continued with Pamela’s All-Purpose Gluten-Free Artisan Blend last week. 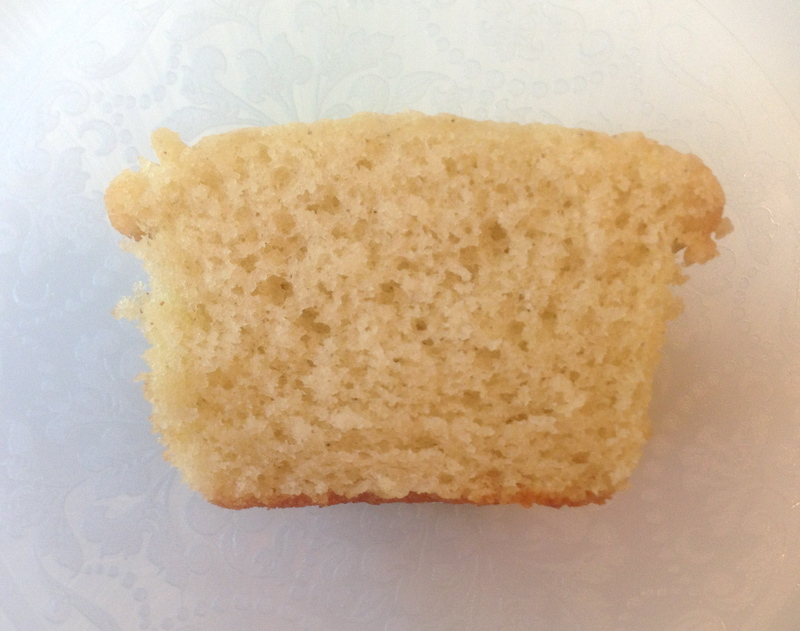 And this week, I’m reporting on what happened when I gave Bob’s Red Mill Gluten-Free 1-to-1 Baking Flour my cupcake test. The front of the package says to “Use this astounding blend in place of wheat flour in your favorite recipes for cookies, cakes, brownies, pancakes, pies, muffins and more.” I hope to be astounded. I have high regard for Bob’s Red Mill and their products. I think they make many excellent gluten-free flours and I use several of them, along with their xanthan gum, guar gum, and gluten-free oatmeal. Unlike some people in the gluten-free community however, I have not been a fan of any of their baking mixes. But, just like Pamela’s, Bob’s has good distribution in grocery and specialty stores around the country. No shipping, no worries about finding it. I have high hopes that at least one of these companies can develop a cup for cup blend so good that I can give adaptations for using it with my recipes. It would be nice to have a little more choice when it comes to what gluten-free flours I reach for. The goal of my cupcake test is very clear and simple. I want to see what happens when I use a purportedly “cup for cup” gluten-free flour blend in a classic wheat recipe that I know works well and tastes good. It has to be a recipe that I’ve been able to successfully convert to gluten-free using my Brown Rice Flour Mix in such a way that it is indistinguishable from the wheat version. My mix is made with very finely ground brown rice flour (I like Authentic Foods), potato starch, and tapioca starch. It is not a cup-for- cup blend. (Authentic Foods also makes a product called GF Classics Blend that is my Brown Rice Flour Mix already mixed up in a bag). Why my vanilla cupcake recipe? Because the original wheat recipe doesn’t contain a lot of ingredients and it needs very few changes to make it gluten-free (1/2 teaspoon of xanthan gum and 3/8 teaspoon increase in baking powder). Also important – both the wheat and gluten-free versions of this recipe make a delicious, light and tender cupcake. So the idea here is that I already have a gluten-free flour mix that works well in the original wheat recipe. In order for the new “cup-for-cup” blend to pass the test, it would have to work as well or better. The Bob’s Red Mill’s Gluten-Free 1-to-1 Baking Flour has far fewer ingredients than the Pamela’s blend. Thankfully, the folks at Bob’s decided they didn’t need to throw in everything they had in the warehouse. But the alarms went off when I saw the first ingredient — sweet white rice flour. In my experience, sweet rice flour doesn’t really need to be included in most gluten-free recipes, and in this case, here it is making up the largest amount of the blend. The list of ingredients on the package is as follows: Sweet Rice Flour, Whole Grain Brown Rice Flour, Potato Starch, Whole Grain Sweet White Sorghum Flour, Tapioca Flour, Xanthan Gum. Again, my guess is that in Bob’s good-intentioned attempt to banish the dry and gritty reputation of gluten-free baked goods, they went large on the wetter, moisture-giving flours. And again, based on my experience, I was worried they might have over-compensated. But for the first round of the test, I wanted to see if the blend worked as described on the package- as a cup-for-cup replacement for wheat flour. I opened the bag. The Bob’s blend was slightly grittier than both the Pamela’s Artisan Blend and my Brown Rice Flour Mix (made with finely ground brown rice flour from Authentic Foods). Interestingly, it was less gritty than my Brown Rice Flour Mix made with Bob’s Red Mill Brown Rice Flour (I had some made up in my pantry that I use to make pizza crust). It smelled fresh and mild with no stale or rancid odors. The Bob’s blend mixed up more “liquidity” than my mix and a lot more like the Pamela’s blend (the Thomas Keller Cup4Cup mixed up gooey and thick and the Nameste Perfect Flour blend mixed up in a way that was very similar to my blend). The cupcakes didn’t rise particularly well as they baked in the oven and they were very light in color, but the tops were nice and smooth. They also shrunk a bit more than I expected as they cooled. I cut one of the cupcakes in half to take a look. The inside was really dense, with small air pockets. It tasted good, and in fact, there was no real difference in flavor between it and the one made with my mix. But it was really gummy, and kind of wet and chewy, and a bit tough. It also had a small amount of grit. Not a lot, but it was noticeable enough to be noticeable. I was clearly under-astounded with the way the Bob’s blend worked in one of my favorite recipes. And disappointed. I really think there is too much sweet rice flour in Bob’s Red Mill’s Gluten-Free 1-to-1 Baking Flour. And maybe potato starch. And maybe too much xanthan gum. And the ratio of whole grain flour (brown rice flour and sorghum) to starch seems off. But I gave Bob’s Red Mill the same second round test I gave Pamela’s in which I took out 1 tablespoon milk and 1 tablespoon canola oil, and I increased the baking powder to the same amount as I use in my gluten-free version with my flour mix. 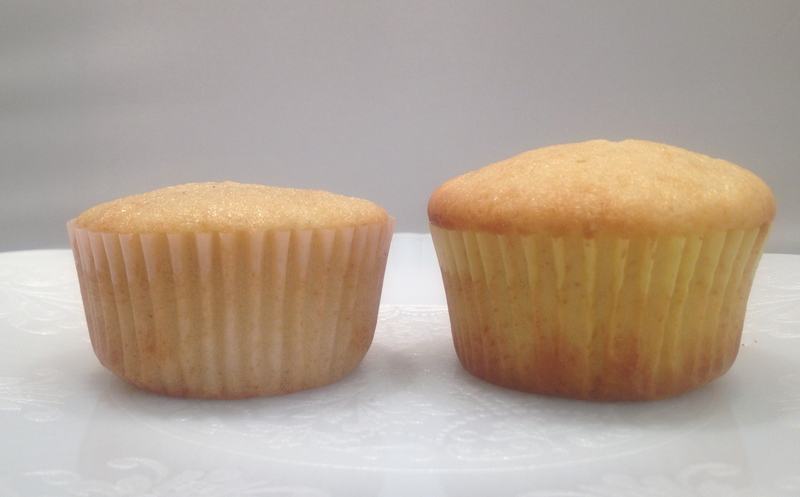 The second round cupcakes didn’t rise all that much more and the air pockets only got a little bigger. The one I cut in half and then tasted was still too gummy, chewy and tough. And that noticeable bit of grit was still noticeable. However, it was less “wet”. Was it good enough for me to put on frosting and serve to my family? Sadly, no. And I say sadly because I still had some of that homemade coconut frosting from the second round test on the Pamela’s blend – and I was looking forward to using it up. As it currently stands, I don’t think Bob’s Red Mill Gluten-Free 1-to-1 Baking Flour can be called a “cup for cup” all-purpose blend – because it’s not. I’m not even sure it has enough promise in its current state for me to try to use it in other recipes from my cookbooks – with adaptations to the recipe. I think Bob’s Red Mill would have to significantly reduce the gummy, chewy and tough factor before I’d do further testing. But I’d be happy to test any new renditions they come up with. Take a look just for fun: the cut cupcakes from the first round of testing. Bob’s Red Mill Gluten-Free 1-to-1 Baking Flour on the left, my Brown Rice Flour Mix (made with Authentic Foods) in the middle and Pamela’s All Purpose Artisan Blend on the right. In using the phrase “cup for cup”, are you substituting all-purpose GF flour for wheat flour or a home made GF blend? I have substituted GF all-purpose for a home made GF blend but never dreamed of using instead of wheat flour in my old facorite recipes. My understanding of it is as follows: All purpose gluten-free flour can be used in to make a wheat recipe gluten-free- but you will need to add something to replace the gluten (usually xanthan gum or guar gum), and you will have to tweak the recipe a bit to make it work. My Brown Rice Flour Mix is an “all-purpose” flour. I use it to make cakes, pie and tart crusts, cookies, muffins and other pastries (and I have a different Bread Flour Mix that I use to make my breads). I have to add xanthan gum and tweak my recipes (most of which started as I wheat recipe) to make my mix work well. A gluten-free all purpose “cup-for-cup” flour is supposed to be able to be used in place of wheat flour in a wheat recipe to make that recipe gluten-free. For example, if a recipe calls for 2 cups of wheat flour, you ideally should be able to replace it with 2 cups of a gluten-free cup-for-cup blend. Here in my test, I am replacing the wheat flour in a wheat cupcake recipe with a supposedly gluten-free all purpose cup-for cup flour and comparing to a cupcake using the same recipe that has been tweaked to use my gluten-free all-purpose Brown Rice Flour Mix – which works really, really well. The cupcake when made with my mix is indistinguishable from the wheat one. The cup-for-cup flour would have to work as well in order for me to want to use it, too. Hope this clarifies it for you! P.S. So far, I haven’t found one that works the way the manufacturer markets it. I think it’s all very misleading to bakers. I do wish one of these flours would have worked really well though! It would have been nice. Hope springs eternal….. Authentic Foods has a gluten free “Classics” blend with your name on the label. Have you ever tested it against your home-blended recipe? I’d be interested in that comparison. I use it all the time. And it is exactly what I end up with when I make my blend myself — because I use their Extra Finely Ground Brown Rice Flour. I do want to say, I do not have a financial interest/agreement with Authentic Foods. But the blend is modeled after mine. I think it helps to reassure people that it’s possible to make good gluten-free baked goods— if they can bake something that works well the very first time they try. And recipe on their bag is the cupcake recipe I used here in the test. It works well. I also allowed Authentic Foods to use it on the package with the hope that perhaps people might commit to buying one of my books after they try the recipe. I use the Martha Stewart “One Bowl Chocolate Cupcake” recipe with Bob’s Gluten Free Flour instead of wheat flour. I have had a lot of success with the recipe. That recipe is a classic- simple to make and, for most people, it’s dependable. It makes sense that it works with the Bob’s Red Mill. But I wonder– it is as light as it normally would be with wheat? I have been using your Baking Classics as my only GF book for several years now and haven’t found a bad desert yet! Ever since eating GF Bread in San Francisco, I have been wanting to try making Sourdough GF Bread using Sourdough Starter. Have you tried this yet? I’ve been testing sourdough recipes for years (too many to admit), but have never – yet – had one that minded me of what I was missing. I’ve tried creating various starters, created my own recipes, and tested recipes from others I respect. I’ve even tried a very good quality sour dough bread mix from a company I have very high regard for (Charles Luce- Luce’s Gluten-Free). But none gave me what I was looking for. Another issue for me is that I don’t really eat a lot bread (about once a month), so the time, money, and effort required to keep a starter alive and kicking isn’t worth it. When I do want a bread along the lines of what I remember and miss most about San Francisco sour dough, I now make the new “No-Knead Bread” recipe from my new book (Gluten-Free Baking Classics- The Heirloom Collection). It has a very long rise (about 14 hours) and bakes in a heavy Dutch oven. It amazes me and makes happy every time I bake it. You can see a picture of it here: http://mygluten-freetable.com/2015/02/gluten-free-baking-classics-the-heirloom-collection/. I’m sorry to disappoint you on a “real” San Francisco sour dough though. But this new recipe, might do the trick for you. I’m happy to hear you are enjoying the recipes from my first book! Please let me know if you have any other questions. I am overwhelmed by this, but it was a great read! I recently just found out that two of my close relatives (one who nannies my children) have gluten allergies. I am wanting to do nice things for them like bake pumpkin breads, cookies, and make pizzas etc. I want the nanny relative to have fun with baking the same items my kids will eat. I went to Sprouts and spent a ton of money on gluten free items. I purchased this 1-to-1 and was hoping to use it to make pumpkin bread. Do you have any suggestions on how to plump up this flour so that it won’t be flat? I wish I knew the science behind baking but if it isn’t a recipe then I can’t bake it and definitely cannot tweak it. For cakes, sweet breads and muffins: Mix up your own blend by adding 1/4 cup of plain Bob’s Red Mill Brown Rice Flour to every cup of his 1-to-1 (shake it up in a container and then measure out what you need for the recipe), and then, leave out a tablespoon of liquid from the recipe as a first round test. For cookies, I’d add 2 tablespoons of Bob’s Red Mill Brown Rice Flour to every cup of his 1-to-1 (and again, shake it up in a container and then measure out what you need). I don’t think you’ll have to adjust the fat, but I’m not sure. If you want to try a really good gluten-free pumpkin bread, there is a recipe on my FoodPhilosopher website in the baking section (along with a lot of other basic recipes). If you don’t want to or can’t buy the Authentic Foods brown rice flour that I love (or GF Classic Blend which is my blend already made up in a bag) and typically recommend, make my Brown Rice Flour Mix using the Bob’s Red Mill Brown Rice Flour or King Arthur Brown Rice Flour. They are a little more gritty, but it will make a fine pumpkin bread. If you do decide that you like my recipe, my first book Gluten-Free Baking Classics, might be ideal for you. It has everything you need to get started including a great pizza recipe and chocolate chip cookies that were featured in Gourmet magazine back in 2005. For a more detailed discussion about the science of gluten-free baking and instructions on how to convert recipes, try my new book Gluten-Free Baking Classics- The Heirloom Collection. It also has a lot of really great recipes. And let me know if you have any other questions. You can also email me through this website if you need. I have only tried her original gluten-free flour blend (not her product specific mixes, like bread or pizza or cookies). Her blend contains more white, starchy flours than mine, as well as modified tapioca starch (I don’t like to use modified starches in my baked goods). However, I know her blend works very well in her carefully crafted recipes, and the baked goods made with her flours taste good! It’s a matter of palette. Some people really don’t like the taste of the whole grain brown rice flour I use in my all purpose mix (it is 2/3 of the blend), or the millet and sorghum I use in my bread flour mix (1/2 the blend). Thankfully, Jules offers a good alternative flour blend and well-tested recipes that work with it. I can’t say that about everyone. Moreover, I have very high regard for Jules and all she has done for those of us in the gluten-free community. I’ve met her and I like her. It’s hard not to. She’s a really kind and caring person. I bought a piece of quiche at the cafe at our local health foods store. The crust was so good I asked the cook to tell me how he made it. He told me he used Bob’s Red Mill 1 to 1 flour, butter, salt, and water. I went home and made 4 quiches. The crusts rolled out JUST like my old wheat recipe crusts. I had ALWAYS loved to bake pies. Not being able to make pie when I had to stop eating gluten was very, very sad for me. Then I used the flour it to make my old Oatmeal Cookie recipe (one that I used to make with wheat flour). My son told me that they tasted JUST like they did when I used to make them with wheat. May I suggest you try this flour to make cookies and pie crusts? For my cakes I use Pamela’s Pancake Mix. I just omit the baking powder. It works really well and I love the almond meal flavor. I went through a period when I was using Jules flour for everything but I honestly like Bob’s better for pies and cookies. I absolutely HATED Nameste. The cake I made with it had the texture of the inside of a cream puff that wasn’t baked enough. Bleah! Forget about making cookies with it. As far as gritty flour goes, if you want to mix your own flour but don’t like the gritty feel of rice flour then buy your rice flour at a Chinese grocery store it is much finer. It is also a heck of a lot less expensive. Same thing with tapioca flour. I have not been able to find organic rice flour at the Chinese grocery store. I actually agree with you that the Bob’s Red Mill 1-to-1 Baking Flour works better in cookies and pie crusts. Which is exactly why it isn’t really an a one to one replacement for wheat in wheat recipes. Unsuspecting new-to-gluten-free bakers won’t know that until they try to make a chocolate cake or apple cinnamon muffins and fail. I simply think Bob’s should label the blend better. It’s almost as though they calibrated the it more for cookies and pie crust rather than cake and muffins. I ended up testing out the rest of the bag in non-cake/muffin recipes where it is more likely to produce an “OK” baked good – never a fabulous baked good. In other words, I still like my brown rice flour mix better as an all-purpose flour for baked goods that aren’t bread. Thank you so much for helping to confirm my concerns- and for giving hope to people who read this post that they will be able to use up their bag of flour! This Thanksgiving, I made pie crusts with BRM 1 to 1 flour mix with great success. But I made your Cranberry Nut Bread (from Gluten-free Baking Classics), which is normally fabulous, substituting BRM 1 to 1 for your mix because I was traveling and that was all I had, and it was not very good. On the other hand, I have done the same with your pumpkin bread and it came out fine. My conclusion is that the BRM 1 to 1 mix works best in recipes that are very high in fat (pie crust) or very moist and dense (like pumpkin bread), but not anything that you want to be at all light and fluffy. Anyone who is interested in making GF versions of traditional baked goods should have your book. It is the best. Thank you for passing on your observation about the BRM 1 to 1! It’s interesting that it worked in the pumpkin bread. And I tend to think that since their blend results in a denser, wetter baked good, that you are correct about the best types of recipes to use it in. I’m glad you are enjoying my recipes! Hope you get to try some of the new ones on this blog over the holidays! Hi! Where can i see the recipie that you said for the pie crust using the bob’s one to one flour? Thank u! You can find the pie crust recipe here on this blog. Simply look for one of my pie recipes – like the cherry frangipane. The look for the Traditinal Pie Crust recipe at the end of the post toward the bottom of the page. There is also an easy Tart Shell recipe here on this blog. It is used in several other pie recieps, like the Lemon Cream Pie. You rock Annalise!!! This was incredibly useful. Thank you!!! Hi. Thanks for your informative article. I am late to the conversation, but I just used Bob’s 1:1 for snickerdoodles and biscotti. I am very disappointed. First of all, my cookies were flat; not lacy or crumbly, thank goodness, but really fell during cooling. 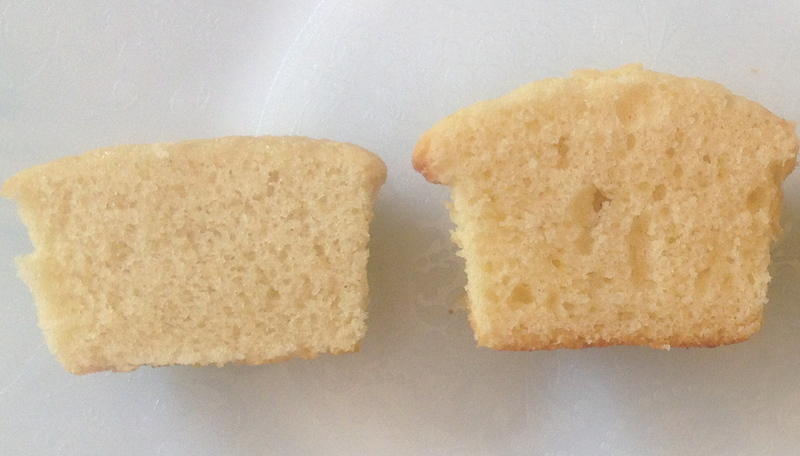 Secondly, there is a grittiness that is very noticeable in the batter and the finished product. I am currently thawing butter to make another round of baked goods as these were meant to be gifts, but the grittiness is just too prevalent. I am a thumbs down on this product. Yes, I wish Bob’s would change the the combination of flours they use in their blend to something that is more dependable, too! But FYI- I have a gluten-free Snickerdoodle on my old website, if you want to try it (scroll down until you see it on the recipe archive) http://www.foodphilosopher.com/assets/docs/recarchall.cfm. And there are three different biscotti in my Gluten-Free Baking Classics cookbook, and another one here on this blog. I hope you are able to give them a try! Last night I “tried” to make Oatmeal Cranberry White Chocolate Chip cookies using the Bobs 1 to 1. I didn’t add Xanthan Gum as I rarely, rarely bake, didn’t know I should/would need to…and besides, this is a 1 to 1 mix so again, didn’t think I’d need to add anything. They’re dry. They taste “okay” as far as GF cookies go…but now I’m really excited to try the Authentic Foods version of what you created – the AF GF Classical Blend. Now for my questions – even while using this, I still need to add Xanthan Gum, correct? Also, what type of vegetable shortening do you recommend? I really want to try your Chocolate Chip Cookie recipe that was featured in Gourmet! Thanks! …I want to add if it wasn’t clear – I’m very new to GF baking. I did use the Bobs 1 to 1 for Pizzelles with my Cuisinart Pizzelle maker and used their recipe and just substituted their call for flour with the Bobs 1 to 1. The Pizzelles came out great and I can’t tell their GF – neither could my family. The Oatmeal Cranberry White Chip cookies just came out completely dry. They were only BARELY moist for about 10 minutes right out of the oven and from there they just went to dry and crispy. They’re still sweet and the cranberries and chips make them taste decent…but I was looking for a “replica” of these cookies made with wheat. I didn’t get it…but now want to try them using the AF GF Classical Blend. Ahh! You found out why I’m not a fan of Bob’s 1-to-1 flour mix product the hard way. I’d like to think they test each recipe they say works with it (like the pizzelle cookies you made). But they sell it as a 1-to-1 replacement for wheat, not as only good for their recipes. In any case, I’m not sure which Oatmeal Cranberry White Chip cookie recipe you used, but if you’d like me to take a look at it before you try another flour (GF Classic Blend), you can send me the details in an email (link on this blog). Remember, you’ll need to add xanthan gum to the recipe. I can help you decide how much if you are unsure. You do need to add xanthan gum to almost all of my recipes (except the pancakes, waffles and crepes). But you are correct about not needing it for the Bob’s 1 to 1 mix. I used Crisco when I developed the recipe (and Gourmet used it as well). However, you can also use Spectrum, if you prefer. My testers used either Crisco or Spectrum (I’ve also used it many times in the recipe and it works well). I’ve never used any other brands, so I can’t say for sure if there are comparable product. But if you use something different and it works, please let me know! Graduation cupcakes my daughter… My fingers are crossed! I just tried the Bob’s Red Mill “1 to 1” for the first time. I used it to (try to) make pancakes. The results were less than satisfactory, and I was looking for some advice on what to do. Reading your approach and review, I believe you might be able to help, as you seem quite knowledgeable and capable in the baking department. The bottom line is the mix is too gummy, which would be great if I wanted to make crepes, but for pancakes…no thanks! I am wondering what, if anything, could be added, and in what measure, to counteract this gumminess, which I believe is from the potato starch. The cakes cook beautifully on the outside, but remain sticky/gummy in the middle even after a long time on the griddle. I know there must be a solution, but I wasn’t sure if it involves adjusting the blend by adding a certain proportion of a single ingredient flour, or more eggs or just what exactly. I like the taste of this mix OK, but I can’t deal with this excessive gumminess. Any suggestions? Thank you in advance for any help you might provide. The sweet rice flour and xanthan gum are probably more to blame for the sticky/gummy aspect. Potato starch is typically used to impart a delicate crumb and rich mouth feel, but too much can make a baked good wetter, denser and too chewy. You don’t ever really need xanthan gum -or sweet rice flour – in a pancake or crepe recipe. That is the biggest issue here. The only thing that might help you to make a decent pancake with this blend is to add another totally different kind of delicious flour- like an almond flour or coconut flour. To make one cup of flour try 2/3 cup of the blend and 1/3 cup of almond or coconut flour. It worked for the Nameste blend – for pancakes. It might work here as well. Please let me know how you make out! I ordered Gluten Free flour from: https://glutenfreegirl.com I haven’t baked with it yet but am going to try my Texas Sheet Cake…. I also have Bob’s Red Mill but think I will use the one from Glutenfreegirl. The cake does call for eggs and I need to substitute something for the eggs. I have been reading that you can use 1/4 or 1/3 cup of applesauce for each egg in a recipe. Have you ever subbed out eggs and used something else? I am going to use erithytol for the sweetener in the cake and maybe use regular powdered sugar or a combo in the icing. We need a birthday cake for this weekend that my grandson can also eat…hence no gluten, no eggs and no nut flours. thanks! Sorry for delay responding! In general, there are some egg-free bakers who sub out eggs with applesauce- but it depends on the recipe. And you usually have to adjust other ingredients (liquid, baking powder/soda, etc.). It is impossible for me to recommend a specific egg substitute for a recipe that I cannot see and for flour blends that are configured completely differently than mine. If you are using glutenfreegirl’s flour, you might consider asking her. Her blend is very different than mine, and she doesn’t use xanthan gum in her recipes, which also effects the rise and texture and appearance. I also never use artificial sweeteners in my recipes, and as you know if you’ve used them in baking before, they can change the liquid to dry ingredient ratio drastically. Maybe the 1-to-1 flour is good for baking when it is incorporated with many other ingredients (like cupcakes). However I just tried making bread with it and it is not even edible. I, like this recipe, substituted the all-purpose flour that i normally use (I have been making this bread for years) for the same amount of 1-to-1 flour. Absolutely horrible. I am not trying to be rude or ungrateful. I hate throwing away food, especially bread. But believe me, this is not even edible. It is so dry, I almost broke my took biting into it (right out of the oven, when it should be the most soft and delicious!). My husband is devastated that he can’t eat bread and his baked goods anymore. I have tried different things and then I found Bob’s Red Mill 1:1. I have made chocolate chip cookies, pie crust and even pizza crust with BRM 1:1 successfully. My husband likes that it doesn’t have that funny aftertaste. I made cupcakes the other day, they were quite sweet (recipe had a lot of vanilla and sugar) but the texture was ok. I have yet to buy and make my own mix, not that invested yet because it’s very expensive. I would love to make a good bread for him (he currently uses the frozen Against the grain baguettes for his sandwiches but is growing tired of the same old thing. looking for a focaccia bread recipe to use with bobs red mill because that is what i have in my cabinet. Any suggestions would be great. I just bought Bobs 1-1 flour and I like it. I made the blueberry muffins on the bag and we really enjoyed them. That being said I would like your flour recipe. I would like to make a good flour mix that I can make in bulk for when I need it. Have you done a comparison test with the Pillsbury Multi-Purpose Gluten Free flour mix? I have not tested the Pillsbury blend because it is all starch – white rice flour, potato starch and tapioca starch- with a little pea fiber thrown in to give it some character. I’ve been using Bob’s mill for my zucchini, avocado, carrot sweet bread, but I also found it was gummy and didn’t rise. I’ve ordered the GF authentic blend. My original recipe calls for 2 cups of flour. Should I start with 2 cups of the blend, or add more or less than two cups. Do I need to add xanthan gum or anything else to it or is everything I need in the bag. How much baking powder do you recommend and what about baking soda? I’m new at this so I’m quite a novice who’s allergic to almost everything. Thank you for the help. You should start with the 2 cups of flour called for in the recipe. And yes, you would need to add xanthan gum. Without seeing the recipe, I couldn’t possibly give you insight as to what else you would need. It might be a good idea for you to send it to me by email.